If you don’t see the new feature, go to Google’s homepage, click on “Google.com in English” and log in to a Google account. If you still don’t see it, try this URL: http://www.google.com/webhp?sclient=psy. When you start to type a query, Google moves the search box to the top of the page and shows a list of 4 suggestions, followed by the search results for the first suggestion. 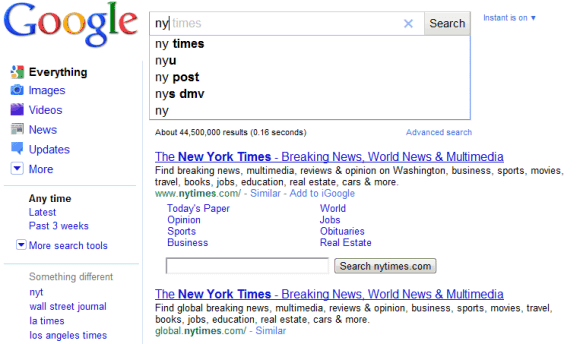 That means you can just type “ny” and get the search results for [ny times] almost instantly. Google shows the predicted query in the search box, but the characters automatically added by Google are grayed out. If you intend to type [ny times crossword], you can press Tab or use the right arrow to add “times” to your query and continue typing “crossword”. Use the up/down arrows to pick a different suggestion and you’ll notice that the results are displayed without having to press Enter. The nice thing about the new interface is that you can use the “I’m feeling lucky” much more easily. For example, to visit the top search result for [ny times crossword], select the suggestion using the down arrow and perform “I’m feeling lucky” using the right arrow. How to visit New York Times homepage using 4 keystrokes? ny Down Right. How to go to Yelp using 4 keystrokes? ye Down Right. Another great thing about the new interface is that the search box always has focus. You never have to click on the search box to add a new word to your query. If you don’t like Google’s suggestions, you can always ignore them and press Enter to find the results for the query that you’ve typed.